WARSAW, Poland, November 11, 2013 (ENS) – The annual United Nations Climate Change Conference opened today with calls for governments to harness the groundswell of action on climate change across all levels of government, business and society and make real progress here towards a successful global climate change agreement in 2015. At the initiative of the European Union and the most vulnerable developing nations, the Durban climate conference in December 2011 launched negotiations for a new legally-binding climate change agreement that covers all countries. It will be adopted in 2015 in Paris and implemented from 2020. Marcin Korolec, Poland’s environment minister is presiding over the Conference of Parties to the UN Framework Convention on Climate Change, known as COP 19. In his opening address today at Warsaw National Stadium Korolec characterized climate change as a global problem that must be turned into a global opportunity. “It’s a problem if we can’t coordinate our actions. It becomes opportunity where we can act together. One country or even a group cannot make a difference. But acting together, united as we are here, we can do it,” said Korolec. 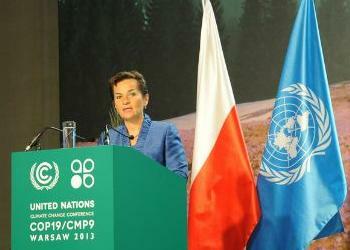 In her opening speech, Christiana Figueres, UNFCCC executive secretary called on delegates to “win the Warsaw opportunity” in order to safeguard present and future generations. With 195 Parties, the UNFCCC has near universal membership. It is the parent treaty of the 1997 Kyoto Protocol, which has been ratified by 192 of the UNFCCC Parties. Both Korolec and Figueres pointed to the sobering realities of climate change and the rise in extreme events that climate science has long predicted, including the devastating Typhoon Haiyan (Yolanda) that just hit the Philippines, one of the most powerful typhoons ever to make landfall. 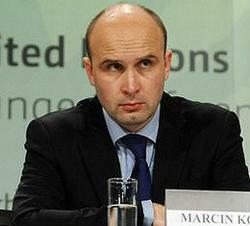 Figueres said there are key areas in which COP 19 can make progress, starting with finance. “We must deliver an effective path to pre-2020 ambition, and develop further clarity for elements of the new agreement that will shape the post-2020 global climate, economic and development agendas,” said Figueres. Warsaw delegates will focus on decisions that will make fully operational the new institutional support under the UNFCCC for developing nations in finance, adaptation and technology. These are the Green Climate Fund, the Technology Mechanism and the Adaptation Committee, all agreed by world leaders at the UN Climate Change Conference in Cancun in 2010. Figueres said the Warsaw meeting is taking place in the context of growing awareness that climate change is real and accelerating, and the growing willingness of people, businesses and governments to take climate action, at all levels of society and policy. More than 100 heads of state and government and ministers are scheduled to attend the high-level segment of COP 19, which begins on November 19 and ends with a decision-making plenary on November 22. To showcase growing climate leadership and contributions to the climate challenge from all sides, special days have been scheduled for official side events alongside the formal negotiations. On November 16-17, the Development and Climate Days organized by the Red Cross/Red Crescent Climate Centre and the Global Environment Facility will explore innovative approaches to climate-smart development. A new official side event will focus on contributions by the information and technology sector to curb emissions and increase the adaptive capacity to respond. The first Global Landscapes Forum will convene on November 16 and 17 at the University of Warsaw. The Forum combines two previous annual conferences, Forest Day and Agriculture, Landscapes and Livelihoods Day. On November 17, Transport Day, delegates are expected to adopt the Warsaw Statement on Low Carbon Transport and Sustainable Development. Fifty speakers and panelists on transportation’s impact on the global climate will include IPCC Chair Dr. Rajendra Pachauri. A Business Forum organized by the UN and the Polish host government will take place next week alongside the meeting. The Caring for Climate Business Forum: Innovation. Ambition. Collaboration November 19-20 will serve as a launching ground for corporate climate action. New activities, resources and commitments in support of the global climate change agenda will be announced by individual businesses, multiple companies, investors and stock exchanges, and public-private partnerships. Gender Day on November 19 will showcase women’s role in meeting the climate challenge. Also next week, the UNFCCC secretariat will showcase Momentum for Change lighthouse activities – climate actions that demonstrate positive results for innovative finance, women and the urban poor. Cities and regions will gather for the first Cities Day on November 21 to highlight their actions. It features the inaugural Ministerial-Mayors Dialogue and a workshop on sustainable urbanization. “National governments alone cannot tackle all corners of climate action, that’s why cities offer their ambitions, capacities and achievements as governmental stakeholders which should be tapped in the new climate regime,” said Gino Van Begin, secretary general of ICLEI, the global organization of cities for sustainability. As the UN climate conference opens, Poland is celebrating November 11 as National Independence Day, a national holiday commemorating the anniversary of regaining independence by the Polish Nation in 1918. Official celebrations, public assemblies and demonstrations are taking place today across Warsaw and the rest of Poland.